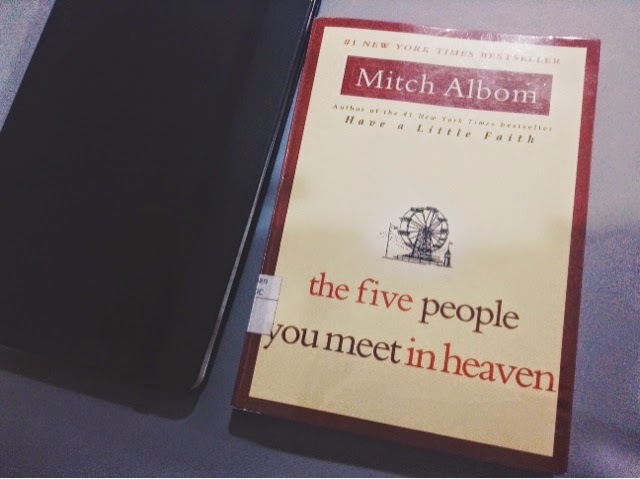 So I just finished reading a book titled "The Five People You Meet in Heaven" by Mitch Albom, and I am left completely wonderstruck. I borrowed this book from the school's library (which explains the little label on the side of the book) and I am so glad I did! 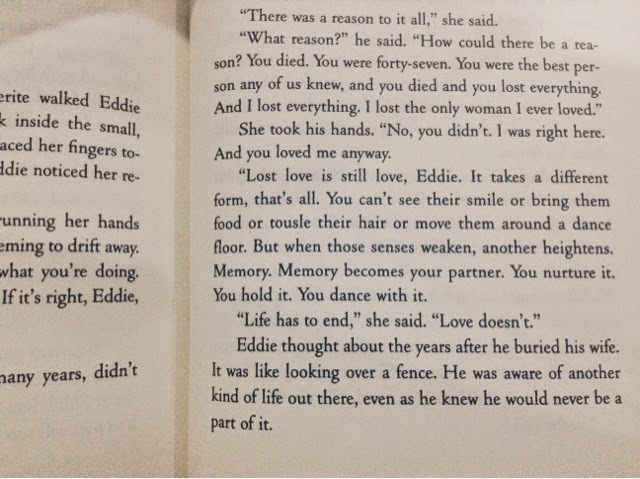 This book basically follows the life and death of a man named Eddie. He is elderly and works as a maintenance man in an amusement park. One day, he heroically attempted to save a little girl from being crushed by one of the carts that were about to fall from one of the rides. Basically, he was trying to get her out of the way and so the cart fell on him instead. The story then follows him through his death and his journey to heaven, where he meets five people who each give him lessons to learn, associated with both his life and his death. Eddie then finds out that these five people actually impacted his life at some point, and so we follow his journey along with flashbacks to Eddie's past. It has 196 pages in it (including the epilogue) and was actually published way back in 2003, although I just discovered it as I was going through the bookshelves of the library. The genre is described as philosophical and religious fiction. I didn't know that this book would be such a big deal to me because it is a pretty small book and in my standards, it kind of easily falls into the category of light reading, but I ended up adoring this book. Fun fact: It actually was a New York Times bestseller for 95 weeks. I don't even think I'm going to forget about this book for a while now. The plot of this book is terrific. It lets you feel like Eddie is holding your hand while going through all of these things (even if it's in a third person POV). It starts with Eddie's dull and sad life, and gets more and more exciting as it continues. The book begins at the end of his life (basically his last few hours on earth), and goes all the way to- well, you'll figure it out. I really loved the setting of this book. Inside the book, we are given many glimpses about life in Eddie's family and home, as well as the park he was working in, which was actually also where he spent most of his life. What I found extremely fascinating was the characters, and how real but unreal they seem to me. 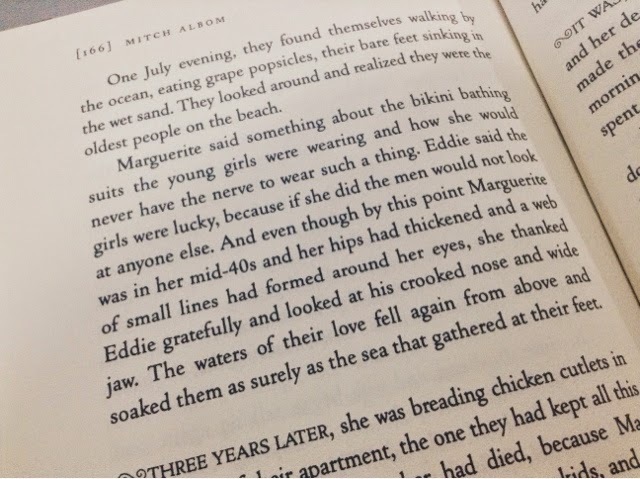 Mitch Albom has a way of portraying and characterising them in the most beautiful and loving way, and his style of writing will forever be my favourite. They easily come to life! I liked that the book left no one as the enemy. It even shed some light on Eddie's father, whom Eddie had always seen as cruel and evil. The main theme, I would say, of this is that there is more to life than we know it. The paths we cross, the places we've been, the emotions we feel, and the people we meet are never accidental. There is no randomness or coincidence, it is a constellation. 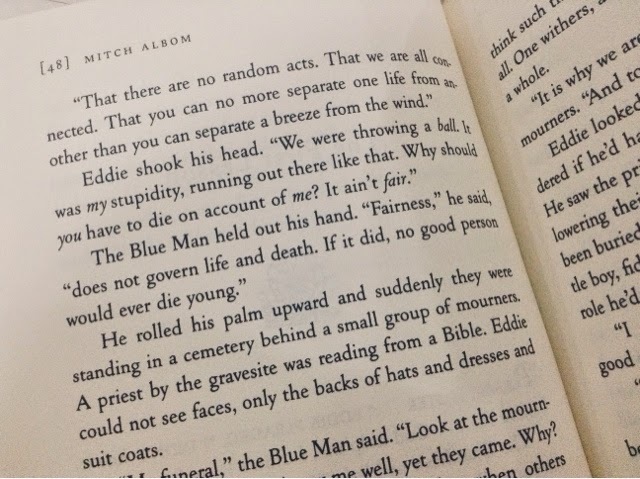 Personally, I have always adored Mitch Albom's works (before this, I read "The Time Keeper"). Most of them are light reading, but I love how his writing goes into every corner of a human's life. I like how he describes human emotion, and how he explains about life and love. Reading the passages feel like sitting in a meaningful lecture. His views on what the world is and how it all works out in the end always takes me to another place. That's what I get from reading his books, and that's why I love it so much! Overall, I really loved this book, and found no flaw in it whatsoever. It's very new for me to find a book that's this perfect. It just suits how I think and feel perfectly. So that's all I have to say about this brilliant book written in this very brief book review. If you have the time, do buy it and read it and indulge in it as gracefully as you can. Treat the book with love, keep it on your nightstand or whatever. Please, read this book. Have you read this book before? What did you think? Or have you read some nice books lately? What are they? Comment below and tell me all about it! I'd love to take a look.